Content marketing has emerged as one of the most effective online real estate marketing strategies, and realtors across the country are incorporating it into their real estate marketing plan. As a result, the number of real estate blogs that are available online is increasing daily. This leaves you with a dilemma: how can you get your real estate blog noticed now that so many realtors have begun blogging? Setting your blog apart from the competition is not easy – you need to come up with interesting real estate blog ideas, flesh them out with dynamic writing that will keep your current readers engaged, while incorporating keywords and search terms in the correct frequency and positions to generate the highest possible search position. This type of writing is called SEO copywriting, and it is not something that realtors can easily learn on the fly. Writing for the web is very different from any other writing that you do as a real estate professional. You will need to write for the search engines as much as you write for your readers. Search engines take into account every element on your real estate webpages, blogs, and other content when determining where they will be positioned in search results. Every part of the page is considered, from the relevance of its title, keywords, and copy, to the quality of its content, its long term performance with inbound and outbound links, and much more. Successful real estate SEO copywriting begins with choosing the right keywords. These keywords need to include the words and phrases that most customers will enter into their search engines when they initiate real estate-related searches. Now, all the other realtors in your market are trying doing the exact same thing for their websites. This means that it will be very difficult to gain a top position for the most obvious, generalized real estate keywords and keyword phrases, because there are already so many real estate websites using them. The best way to achieve a higher ranking in search results is through the use of tightly targeted, hyper local keywords that the larger directory sites and centrally located agencies overlook. 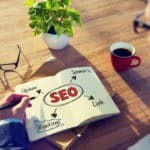 At For Sale Marketing, our SEO copywriters are skilled at discovering the local keywords and keyword phrases that customers looking to move into your area are searching for, so you can bypass the phrases that the large real estate listing services are targeting to gain a higher place in search results. To get your blog post to as many real estate clients as possible, you need a catchy headline that wows clients while providing the SEO-rich keywords that Google loves. We’ll make sure your headline summarizes the main idea of your real estate blog in a way that will satisfy readers and search engines alike. Our SEO copywriters know how to employ the most popular title formats that intrigue visitors and generate the most clicks, including how-to’s, numbered lists, etc. Our writers don’t engage in keyword stuffing; to generate the most search engine power, we’ll just include your focus keyword in a blog title that hits the sweet spot for word and character count. Blogs that are paragraph-dense are hard for viewers to read. Your blogs attract more real estate customers when the text is broken up into short, easily digested bits of information, announced by bolded subheadings for each concept. Bolded subheadings help your readers to focus on the parts of your posts that have the greatest relevance to them, and also up the SEO-value of your post. For Sale Marketing’s copywriters will incorporate your keywords in these subheadings to indicate to Google that they are your blog’s key concepts, which will help to raise your search rank. For Sale Marketing’s SEO copywriters are skilled at creating riveting, relevant content for your website that will keep readers coming back each week. We’ll incorporate a mix of local real estate keywords and contextual keyword phrases to give your blogs the best chance of ranking in the top search result positions. Many writers make the mistake of trying to write their content around the keywords, which tends to leave you with a stiff or awkward-sounding piece. Our copywriters are skilled at incorporating keywords in a natural-sounding way that is always unobtrusive. Nothing turns real estate readers off as quickly as a blog that is filled with misused words, poor grammar, and typos. While grammar and spelling do not directly affect your search position, readers are more likely to share well-written real estate blog posts, which will help increase your website’s visibility. When you hire the SEO copywriters at For Sale Marketing, your content is checked and double checked for typos, spelling errors, contextual errors, and more to ensure that you have well-written blogs and content that readers will love. The real estate SEO copywriters at For Sale Marketing are ready to produce a variety of marketing content to generate real estate leads and raise your real estate agency’s online profile. You can count on us for engaging website copy; interesting, well-written real estate blogs; riveting SEO press releases; and any other real estate promotional content you may need.